With the holidays looming, Mary took advantage of triple points day at West Marine and got me an early Christmas gift — a new chartplotter! 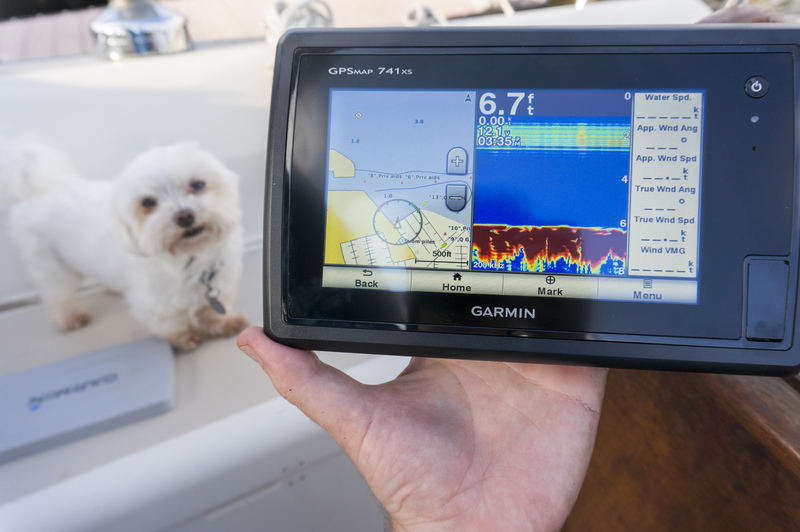 When we bought Gimme Shelter she had a Garmin 498 Chartplotter installed. It was still working, but that model hasn’t been made since 2006, and the screen just couldn’t compare to the units on the market today. 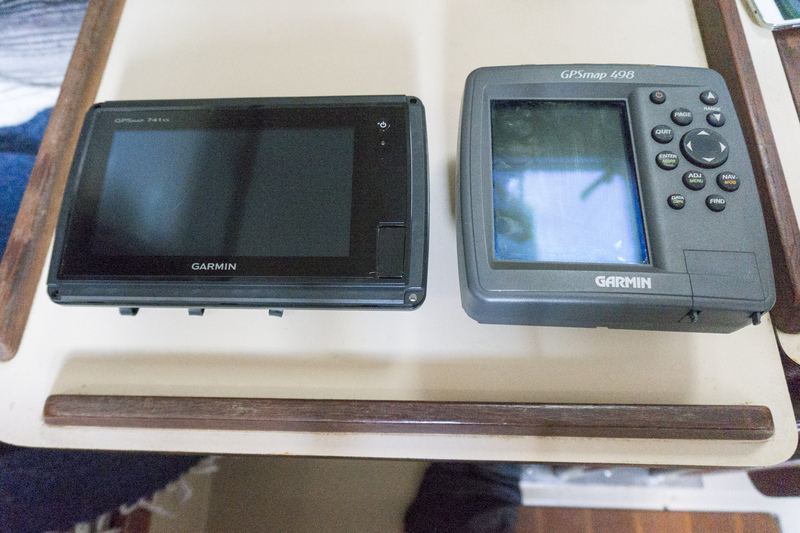 After much research we’d decided to stick with Garmin as we refurbish our instruments in hopes of finally having systems that talk to each other. The 498 had very limited connectivity. You could plug in a transducer, but that’s it. 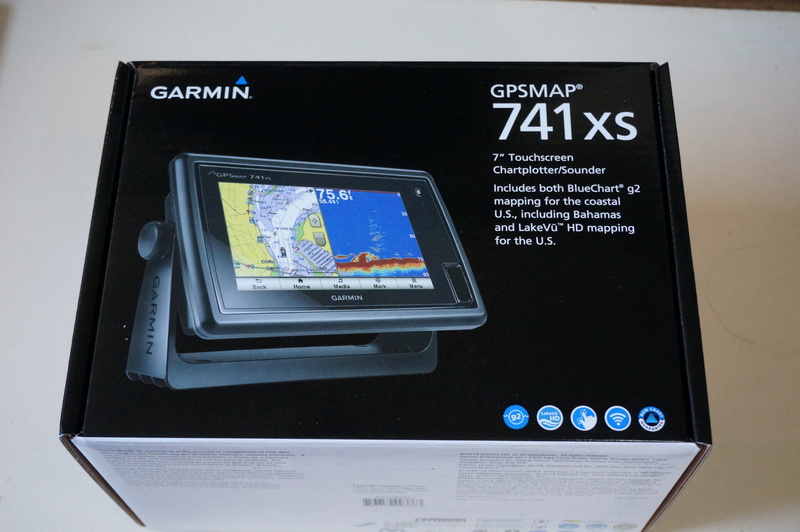 The GPSMAP 741xs had great connectivity options, including wifi and bluetooth, and it was on sale. 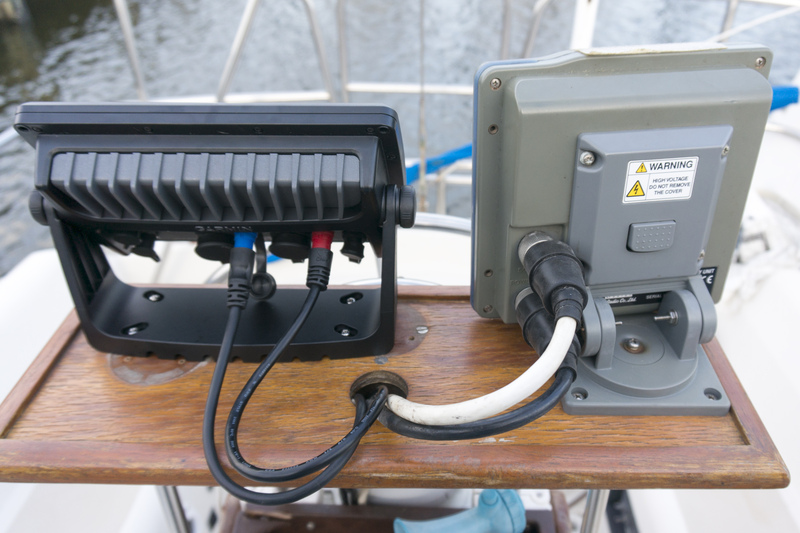 Check out all those plugs – transducer, ethernet, radar, NMEA 2000, and even a camera feed. 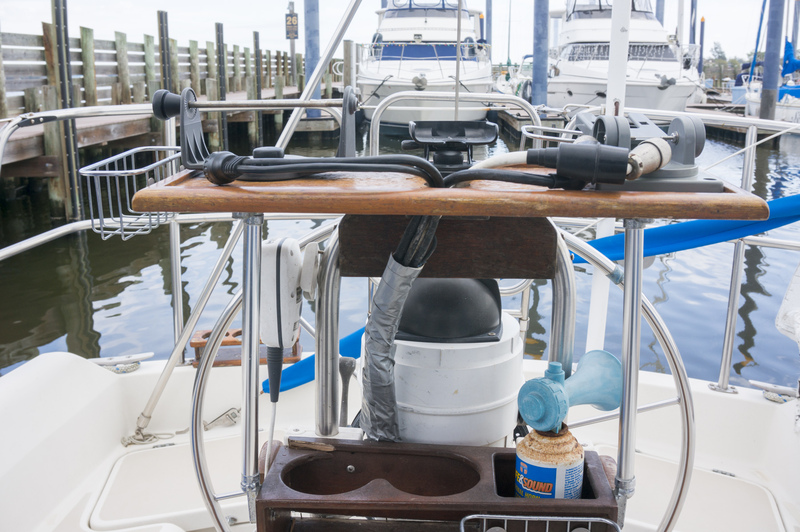 The first step of the install was to figure what wires were running to the helm. This wasn’t as easy as it sounds as what seemed to be a neat bunch of wires was really a ratty mess of wires wrapped in five layers of electrical tape covered by an additional ten layers of duct tape. It took me almost 30 minutes just to get all the tape off. Once it was off, I found quite a mess. 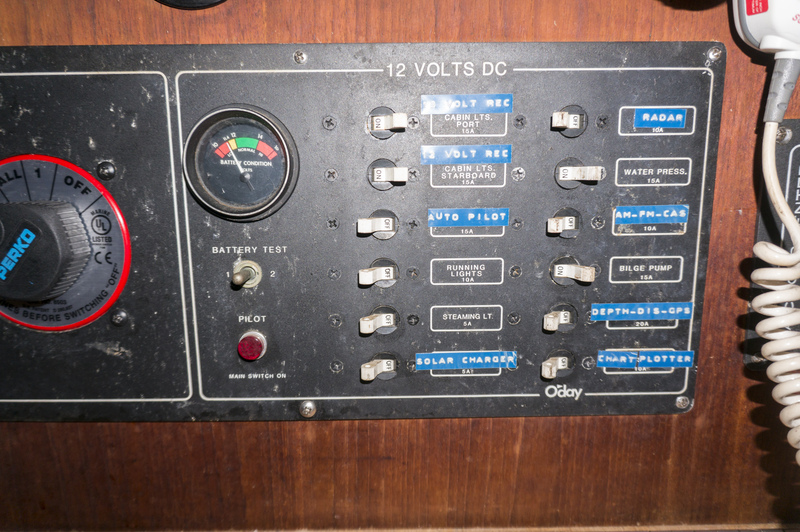 Instead of wiring the old chartplotter at the fuse panel, the previous owner had just run a power cable up the pedestal and wired everything outside of the pedestal. There was also an additional set of disconnected power cables, an unidentifiable black wire, and two gray Cat3 cables in the mix. 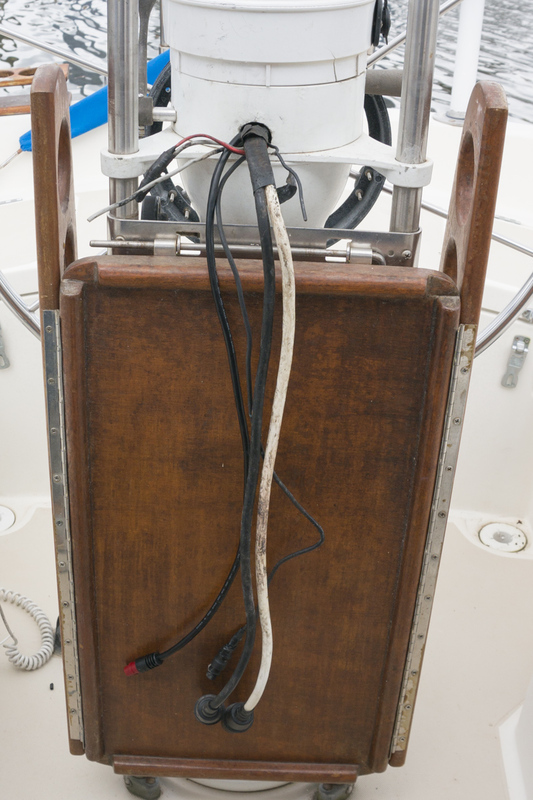 On the downside, tracing all these cables through the belly of the boat trying to figure out to what and where they had been connected was a real pain. On the upside, I had plenty of cables available for snaking my new wires down through the pedestal. I ended up removing four extra cables from the pedestal, and I never did figure out where the Cat3 cables lead. 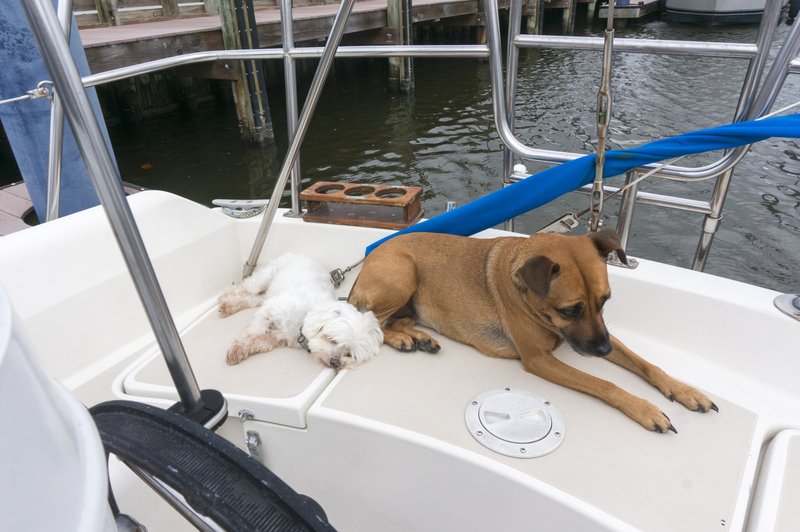 By this point the dogs were incredibly bored with the entire project. Normally, I would have pulled this panel open to connect the chartplotter power lines to the back of a switch, but as there were already power lines running to the pedestal, I just connected to the pre-existing lines. Incidentally, the DEPTH-DIS-GPS switch on our panel is actually the VHF radio. Also, we don’t have a SOLAR CHARGER. I should probably take the time to re-label some of this stuff. After connecting the chartplotter power wires, I ran into the next hurdle. 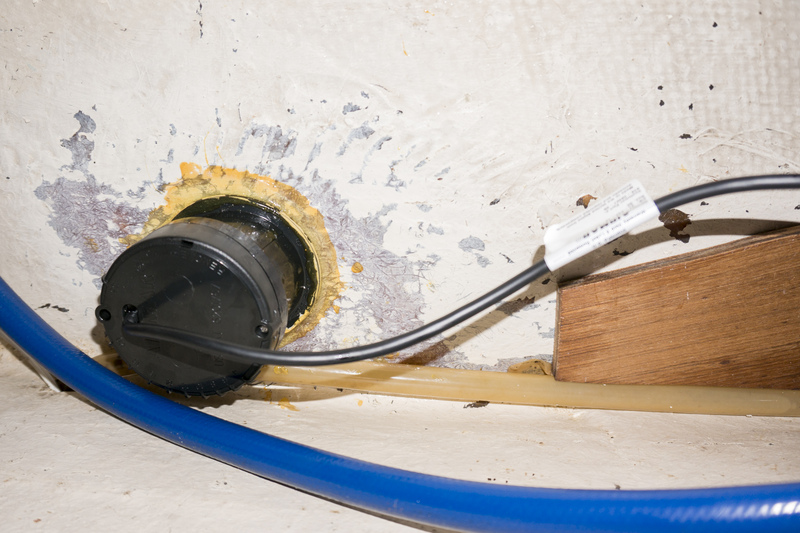 Despite the fact that we already had an Airmar P97 in-hull transducer, it had an older 6-prong plug instead of the new 8-prong plug. That led to a pause in the installation action as we made another trip to West Marine in hopes of finding an adapter. Well, for $69 there is a plug adapter, but it’s not the type of adapter you’re probably imagining. 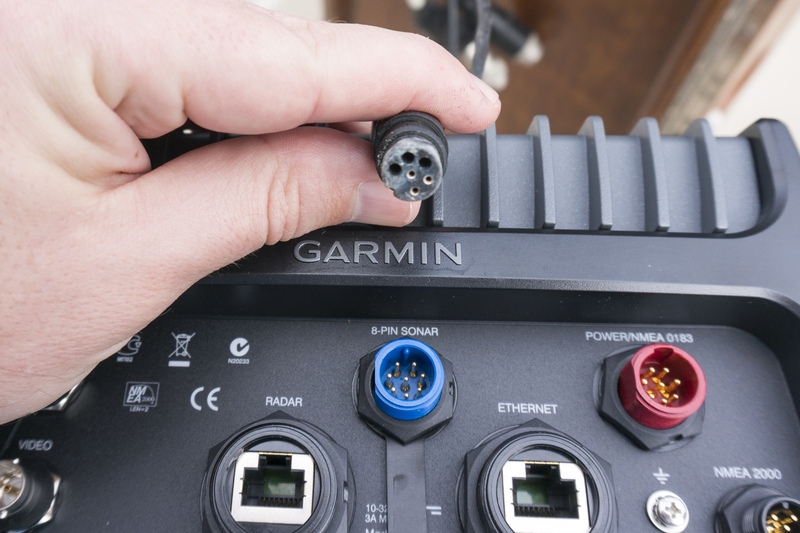 The adapter has an 8-pin plug that runs to a very large junction block. It required you to cut the end off of your 6-pin plug and to wire the three internal wires onto terminals inside the junction block, then close it all back up. You’re left with this very large junction block hanging on a wire outside of your pedestal. 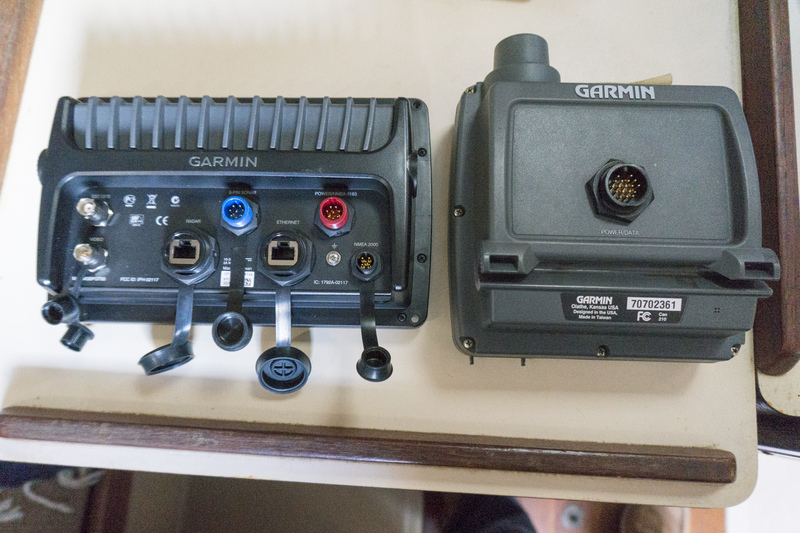 Considering I had just spent the time to remove all the junk wires and re-wire my pedestal correctly, I decided to just take the hit and buy a new Airmar P97 with the correct plug. Thankfully, the new transducer fit right into the cup of the old transducer because I had VERY securely epoxied that thing down during the summer when it had started leaking mineral oil. However, I did not want to cut the new cable to feed it down the pedestal from the top, which brought a new challenge — trying to feed it up the pedestal from the bottom. Grab a wire coat hanger. I’m sure it’s down there somewhere. 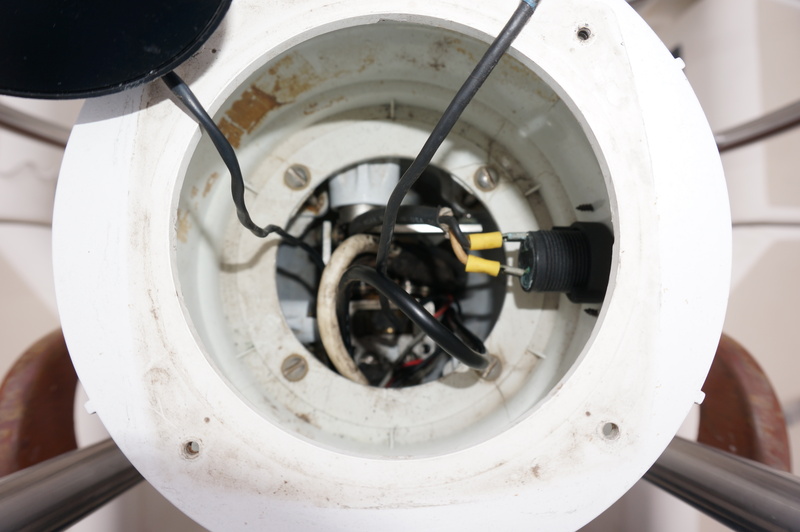 Thankfully all the new wiring worked during testing, so re-assembly of the pedestal could begin. A mere four hours had passed since I’d began the project, and we now had a new touchscreen chartplotter installed. We also no longer had a rat’s nest of wires and duct tape in the pedestal. And the best part of the entire project? 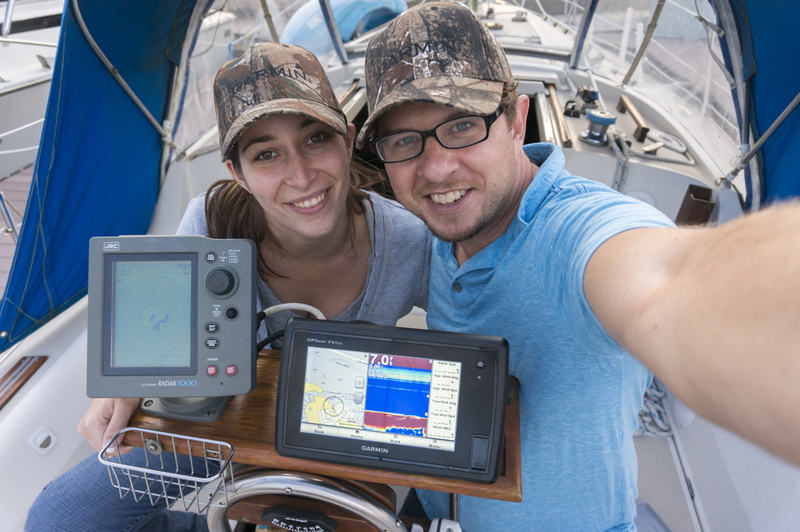 The guy at West Marine gave us free Garmin hats — because there’s nothing you need in the middle of the ocean more than a camouflage hat … ?